250 Watt 6, 500 R.P.M. with all Metal D.B.B. Cable Arm, equipped with 4" dia stone and 2 chucks (Bur & Buffer). 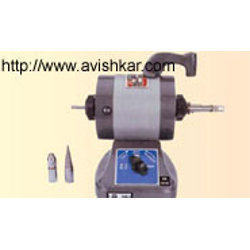 Dental Lathe, which are equipped with double ball bearing and 3 chucks (Buffer, Stone & Bur Chuck). These superior machines are also provided with 2 Imported Ball Bearing Metal cable arm & their attachments. They have the ability to work continuously with a single speed of HP-1/2 2800 rpm. Backed by expert and experienced professionals, we provide Dental Lathe Machine. 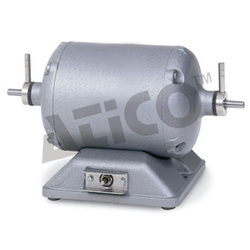 AC, HP-1/2 2800rpm SINGLE speed, Rating continuous Equipped with Double Ball Bearing With 3 chucks (Buffer, stone & Bur chuck), 2 Imported Ball Bearing Metal cable arm & its attachment. Our company has been successful in winning appreciation from the clients as one of the most prominent names in the trading of Dental Lathe. Our reputed entity is engaged in supplying Dental Lathe. • 3 attachment (Buffer, Stone and Bur)& D.B.B Cable Arm.